Either it is represented in children or teenage characters [Moonrise Kingdom (2013) and Rushmore (1998)], or when showing background information from a character’s past [Grand Budapest (2014), Darjeeling Limited (2007), and Royal Tenenbaums (2001)], nostalgia is considered a basic theme. Anderson’s retroversions in a story are not necessarily flashbacks, but integral parts of the story. In fact, the portrayed memories are usually tumultuous, sad, and bizarre. They are either funny or a dramatic revelation. Sometimes they’re historical – such as grand old hotels. Anderson uses nostalgia almost as a lesson covered with over-the-top satire, bringing full meaning to “return to roots” and accepting reality, even with the most awkward past experiences and adventures. By doing this, he allows the audience to travel to a bygone era and remember the art, the people, the culture, behaviors and styles that, as we get older, fall into oblivion. Children are almost always present in Anderson’s films, yet unexpectedly portrayed as adults, capable of handling issues and solving problems, speaking like old college professors and wearing odd costumes that would most likely belong to older people. They are typically smart and witty, separated from anything that would classify them as children. As opposed to this, adults are commonly portrayed as the children, starting unnecessary fights or arguments, speaking in a simpler style, lacking signs of maturity and perception, and an enormous difficulty overcoming obstacles. Max Fischer and Herman Blume (Schwartzman and Murray, respectively) from Rushmore (1998) are the obvious examples in this case, but Moonrise Kingdom (2013) also underlines this topic well. Even the Tenenbaum children are, evidently, smarter than usual, which profoundly contrasts with the father figure in the film. The topic of parental abandonment (or related issues) usually allows children characters to develop friendships with older people—who act as mentors, ultimately becoming surrogate fathers—as they help and keep each other company after an unsettling set of events. Anderson once reported that if he had he not become a filmmaker, he would have enjoyed being an architect. Details are, of course, obligatory elements that fill the sets and fit the characters’ worlds—from paintings to books, photography, music, personal items, wallpapers, etc. Set design in Anderson’s filmography is an art, meticulously considered, from tiny brownstone apartments to color themes to elaborate costumes. In a way, Anderson makes everything that usually surrounds a character a portrayal of that same character, defining personalities and conflicts, creating unique cinematic landscapes. 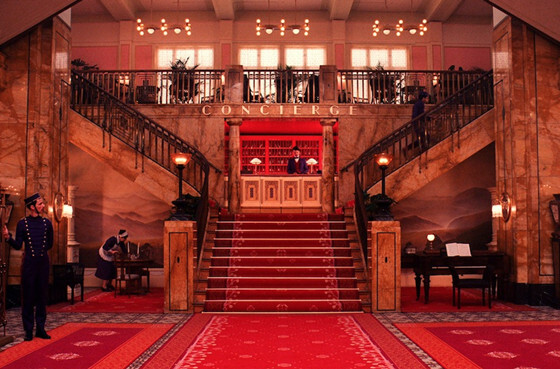 Anderson’s visually stunning sets are formulated with the assistance of production and graphic designers—who have gained more relevance throughout the director’s career—which is evident in most recent works, such as the preposterous design of The Grand Budapest Hotel (2014)—where he built from scratch an entire fictional set that had to change with time. The discovery and loss of love, as portrayed in Anderson’s films, are often featured as both antiquated and precocious circumstances. There’s a preference for writing letters and asserting one’s feelings, mixing awkward situations with highly emotional ones, which are are categorized between satire and fiction inside fiction. Although the love concept appears deceiving, there’s nothing ridiculous or random about how the characters fall in love and how they choose to pursue it. In the end, there’s almost always a lesson to learn, or a feeling of utmost empathy and desire for extremely peculiar characters to get together and live happily ever after. 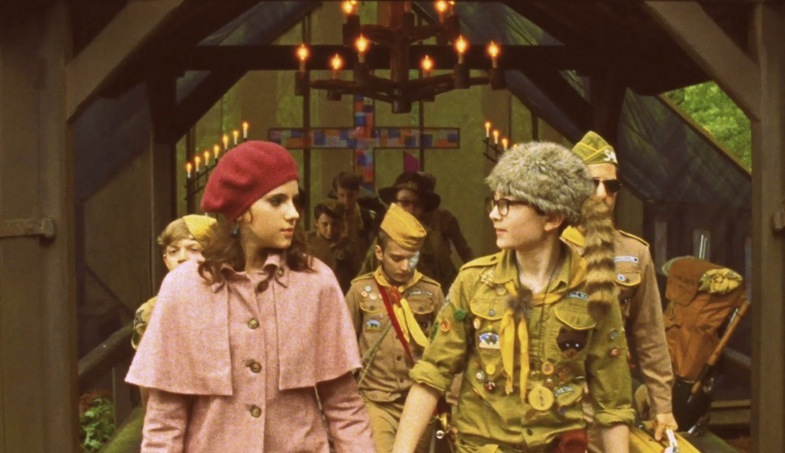 Having to deal with real life tragedies, Wes Anderson, in his typical love stories, has created a normal balance of unrequited love and unconventional relationships. Most importantly, there’s an essential side to Anderson’s “love” concept that involves transcending age, which provides a voice to characters of all ages and their own views of love, showing that anyone is capable of it, and everyone has a right to it. For example, Sam and Suzy are children in love in Moonrise (2013); Richie is in love with his adopted sister Margot in Tenenbaums (2001); and Max is in love with his older teacher, Rosemary, in Rushmore (1998). Hope and warmth are apparent in these love stories, no matter what the characters endure. 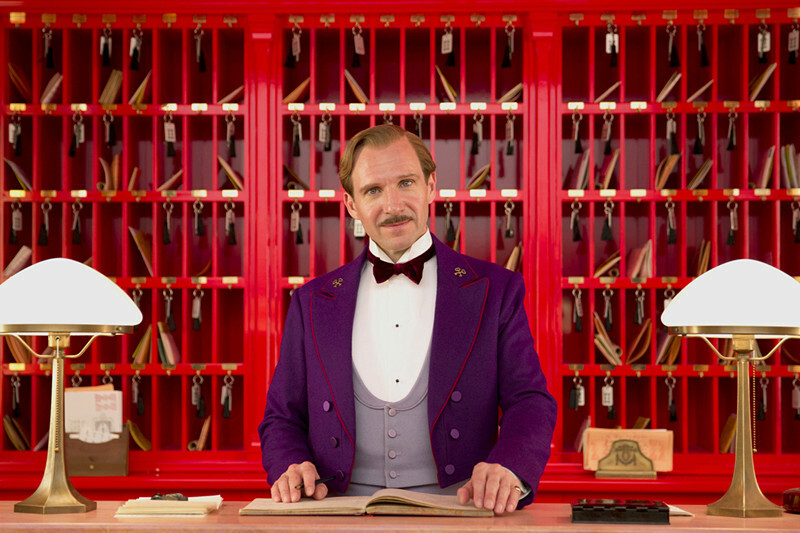 When examining typography in Wes Anderson’s films, an individual will notice that there’s one specific fundamental geometric sans-serif typeface: Futura. Apparently, the director has a slight obsession with the font, making its use consistent in his filmography. Anderson has mentioned this aspect was inspired by old Italian movies, which he loved in his youth, and he now uses Futura as a tribute to them. Typography is an integral part of his films, and is used as transitions, especially via books, places, letters, props, etc. 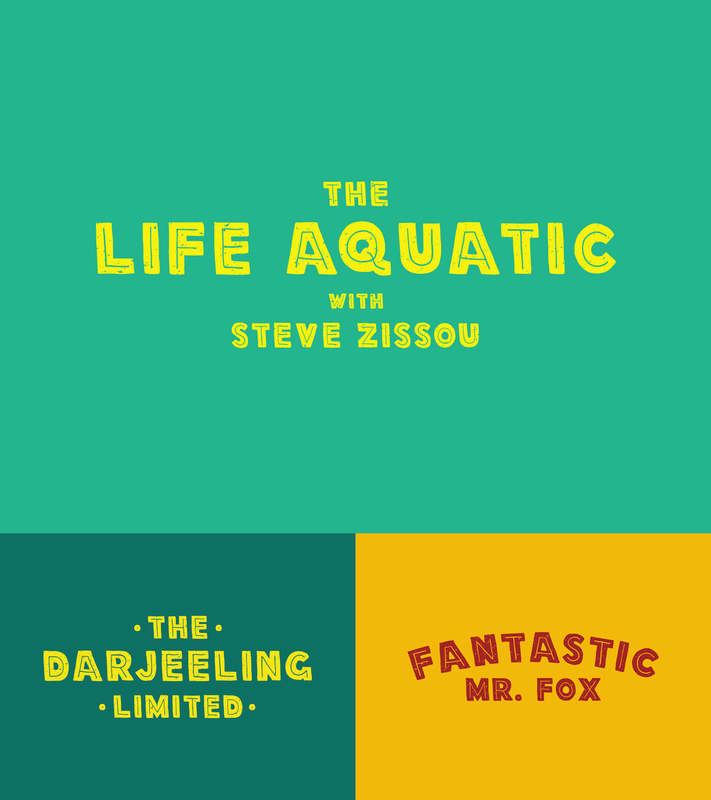 His signature font is just another occupied spot on his detail-obsessed aesthetic, and has gained him a legion of followers and serif-loathing devotees, who were very upset with his use of a different typeface for Moonrise Kingdom (2013), which was designed by Jessica Hische specifically for the film. There’s a common side to an auteur being associated with a particular font, as it with Bergman’s and Woody Allen’s use of Windsor. Anderson’s typographical trademark is yet another extremely pleasing facet of Anderson’s filmmaking. Despite what the entirety of Moonrise Kingdom (2013) suggests, khaki shorts are not everything that constitute Anderson’s fashion in films. Some characters’ ensembles receive more attention than others, but Anderson’s costuming is undoubtedly a vital characteristic in order for each character to fit a specific time, personality, or even mission [cue to Life Aquatic (2004)]. Ridiculous hats and other accessories usually make for great comedy. It’s a way of saying that these characters’ eccentricities are present on the outside, too, for the whole world to see. Anderson has also maintained a clear retro influence, including: Adidas tracksuits from the 1970s, famous sneakers from other decades, tweed jackets, fur coats, bags and business suits, among many others. Anderson knows how to work with these items and how to integrate them into his films because, firstly, he has some sense of style; and secondly, he knows how to work a color palette. While Louis Vuitton constructed luggage for The Darjeeling Limited (2007) and Adidas made sneakers for Team Zissou, Anderson added details such as glasses, random costumes, monochromatic uniforms, patterns, and—evidently—khaki shorts.